Hand picked list of the best WordPress parallax themes designed and developed in 2017. These themes suited for business, portfolio, corporate, personal and any other websites. We tried to cover themes from different sources and for various purposes, so everyone can find the one that suits their needs. Parallax is when things look to be at a different position when viewed along different sightlines. This design trend gained popularity after Apple announced iOS 9 and with parallax backgrounds and now continues this trend with iOS 8 and Mac OS X Yosemite. They are slightly different from ones used in web design but they hold the same principle. For more information on parallax you might want to look at wiki but it might be too scientific for most. For other one page parallax powered WordPress themes you might want to view this theme roundup. While one page layout goes hand in hand with parallax it is now adopted and used for various theme elements such as large header images, sliders, portfolio items, galleries and more. I am wondering how for this parallax scrolling craze will go and when designers will realize that content in many cases is still more important that how it is presented to readers. Jevelin is a handsome and colorful, modern and tech-savvy, engaging and attractive, easy to use and highly responsive WordPress premium multipurpose website theme. 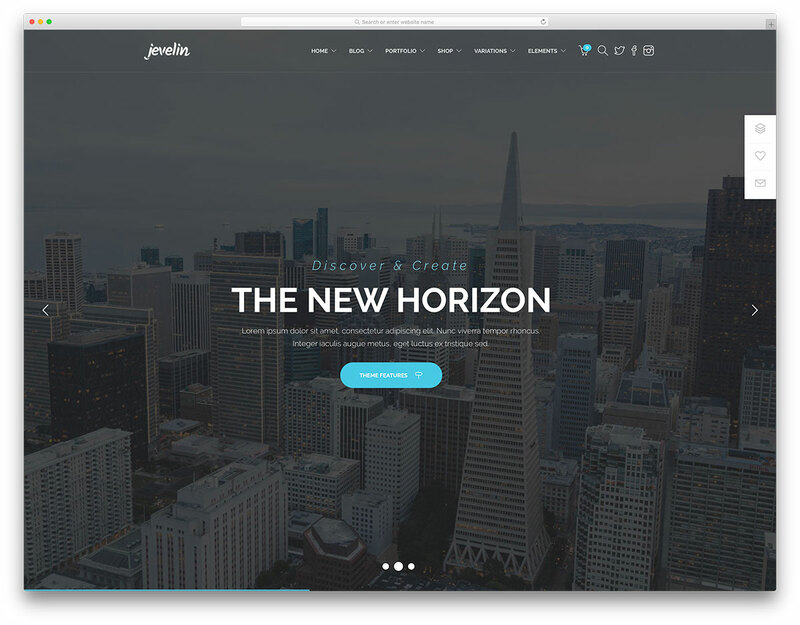 Jevelin is a full-featured framework for the simple and streamlined development of gorgeous, functional modern websites making full usage of the latest and greatest web development technologies on the market today, without requiring absolutely any coding knowledge. Deploying an intuitive framework that makes short work of both superficial and profound graphical and behavioral customization tasks, Jevelin furnishes webmasters with an intuitive drag and drop page builder and hundreds of possibilities as far as admin panel settings go, from layout styling to footer columns, from side area widgets to custom version of your header logo for standard, sticky and mobile presentation, you can’t beat Jevelin’s attention to detail. Hardware-powered Parallax underpins the finest graphical effects within Jevelin, spanning everything from smooth scrolling features to Parallax and Video Parallax background sections you can deploy on any page within your website to great effect, dazzling your audience and keeping them interested and engaged as they peruse your blog posts or your creative portfolio showcases. Mobile-friendly to the core, Jevelin looks great no matter the device. Try Jevelin now, and find out! Ronneby is a luxuriously designed and extensively developed, very easy to use and immensely user and developer friendly, laboriously polished and very high quality, pliable and wonderfully customizable, technologically seamless and extremely robust and reliable, safe and secure, super responsive WordPress high performance multipurpose website theme. Ronneby is a clever and resourceful website theme, designed specifically to satisfy the needs of webmasters far and wide dealing with very upscale, large scale or high quality markets, products and niches, requiring a spotless and impeccable website that performs with fluid smoothness under the most diverse usage cases and traffic load stresses. 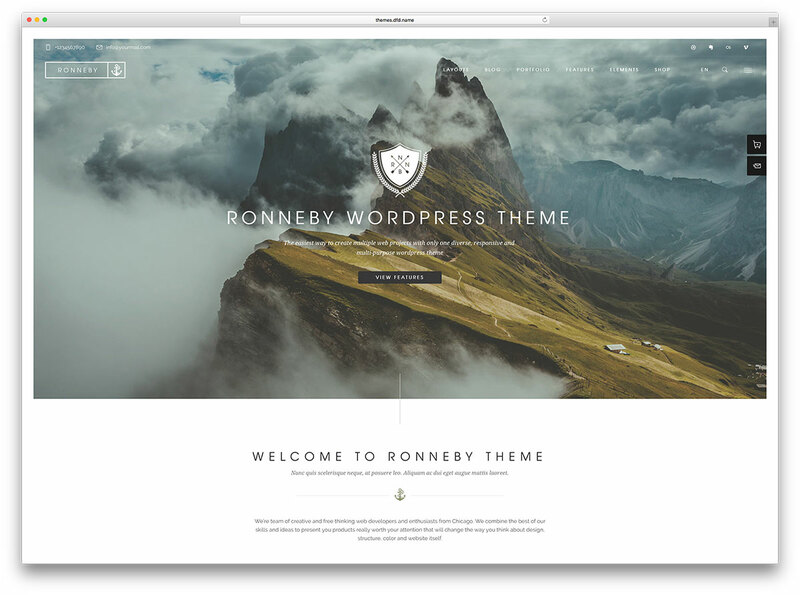 As such, Ronneby is a pixel perfect, painstakingly optimized at the codebase level for speed and efficiency, reliable and scalable website creation toolkit. Packed with the powerful Revolution Slider and the intuitive Visual Composer, which is greatly enhanced and expanded by the premium Ultimate Add-ons for Visual Composer package, Ronneby is very technologically proficient and well-suited for handling modern, seamless website. Extensive hard-powered Parallax technologies run throughout Ronneby, making for a delightful end user experience that is both immersive and dazzling, and will surely result in your visitors coming back for more. Pick Ronneby today, and make the websites you want for the people who will appreciate them! Hatch is a wholly impressive and graphically stunning and colorful, creative and innovative, very easily navigable and incredibly user and developer friendly, modern and technologically proficient, elegant and stylish, keenly polished and readily mobile friendly and responsive WordPress business and corporate multipurpose website theme. Hatch is an extremely cutting edge and impressively capable multipurpose WordPress theme built for flexibility, speed and intuitiveness. Hatch has been constructed with an amazing collection of features and functionalities to endow your websites with all the vigor and dynamism of modern website development technologies while requiring absolutely no previous development or coding experience in order to produce polished and professional results. Hatch has been built on HTML5 code, painstakingly coded for utmost speed and efficiency, with breath-taking visuals styled through eloquent and top of the line CSS3 scripting, with smooth and engaging Parallax scrolling and hardware-powered visual effects, all neatly presented to you through the seamlessly intuitive Visual Composer page builder premium plugin as well as Revolution Slider and Essential Grid, which bring the power of the latest trend-setting visual effects, layout styles and transition animations to your fingertips, through visual, intuitive means. Hatch’s sophisticated, bold handling of Parallax will amaze and impress your visitors from day one! Try Hatch now! Borderland is a visually stunning and highly attractive, conceptually unique and professionally graphically designed, technologically capable and competent, lightning fast and powerfully engaging, user friendly and very cleanly structured, extremely and easily customizable highly responsive WordPress multiconcept, multipurpose website theme. Borderland is a unique and very enveloping WordPress theme, a conceptual approach to website design and development that incorporates a very sleek, smooth and professional quality aesthetic into a powerful technological framework that features robust and modern technologies ranging from W3C valid HTML5 and efficiently dynamic CSS3 styling and effects to jaw-dropping Parallax backgrounds, effects and scrolling, on top of absolutely beautiful and incredibly delicate AJAX powered fading animation effects, all easily toggled and configured from the powerful advanced theme options panel. Borderland includes a whole plethora of creative and convenient layouts and template pages for you to craft your website, as well as an intuitive visual customization process for you to make it your own within minutes, without writing a line of code. Or, you can simply import with a single click one of Borderland’s amazing, fully developed, completely functional and impressively versatile demo websites, included for your convenience. Try Borderland today, and let yourself be taken on a journey! Rhythm is an amazingly vast and ambitiously expansive, graphically colorful and expressive, easily configurable and amply user friendly, highly accessible and very technologically proficient, functionally resourceful and deeply versatile, wonderfully lightweight and fast loading responsive WordPress multipurpose website theme. Rhythm was built to impress, and with its massive collection of over 40 different, unique and conceptually designed demo websites complete with inner pages and dummy content, you are the first one you will be impressed. 37 amazing Portfolio page templates are also packed with Rhythm, ensuring you find the right way to showcase your works, your content or anything you wish for the world to see in the best possible light. 5 jaw-droppingly beautiful and profoundly creative Single Project page templates are also included with Rhythm, as is the premium Visual Composer page builder plugin, which puts all the power of hundreds of shortcodes, widgets and elements readily at your disposal through a simple drag and drop interface completely free from any coding. Amazing and enveloping Parallax hardware-powered visual effects are incorporated into Rhythm demo websites and page templates and readily available through layout and theme options for you to dazzle your audience with smooth scrolling and sophisticated background effects. Feel the Rhythm! Uncode is a swift and tech-savvy, fast-loading and modern, colorful and bold, readily responsive WordPress creative multiuse multipurpose website theme. Uncode is a powerful and convenient website building toolkit powered by a set of premium plugins and a wealth of handy shortcodes coordinated to offer a range of skills that can cover just about any website requirements of specifications imaginable. With 30 different concept demo homepages and a myriad templates to choose from, on top of an enhanced version of the Visual Composer plugin to fiddle with layouts, styles and shortcodes to your heart’s content, Uncode truly is all about delivering the websites you have always dreamed of, within minutes, without having to write a single line of code yourself. With Uncode, sophisticated features are delivered right to your fingertips, from full-fledged e-Commerce online shop capabilities powered by WooCommerce to breath-taking sliders powered by Revolution Slider and LayerSlider, Uncode knows how to dress to impress. With exclusively designed hardware-powered Parallax visual features and effects available all across this visually stunning theme, Uncode makes short work of the most ambitious end user experience and envelopment goals, and constitutes a robust Parallax website making tool for webmasters the world over. Try it today! XStore is a beautiful and elegant, sharp and clean, professional and tech-savvy, readily responsive WordPress multipurpose WooCommerce website theme. XStore has been created by a talented team of developers and graphic designers working in conjunction to produce a seamless, visually refined while technologically accomplished product capable of functioning as a commercial storefront for a diverse range of projects across all sorts of fields of interest and businesses or industries. With that in mind, XStore has been equipped with plugins like the Visual Composer and the Slider Revolution, to offer you creative freedom in layout and slider design, while simultaneously packing dozens of laboriously crafted, meticulously predesigned website templates pages for just about any commercial purpose. Among these, the XStore Wedding demo is a brilliant example of visually pure and stimulating graphic design meeting sheer commercial functionality through the wholly integrated WooCommerce e-Commerce plugin suite, which runs through the whole theme rendering XStore a natural salesman. Tasks such as offering up your pricing plans for different product or service packages are incredibly intuitive with XStore, requiring minimal customization and showcasing an elegant style perfect for wedding service provider websites. With XStore, all you need is love, because your wedding website is already all set up! You is an incredibly flexible, surprisingly resourceful, conveniently intuitive and sharply designed responsive WordPress multipurpose website theme. You is a powerfully flexible and coherently structured website building machine, a strong ally to webmasters of any skill or experience level that are looking for a simple solution with depth and breadth to its reach. Creative design agencies, digital design agencies and freelance web designers in general love You because it allows them to work with such a vast clientele on a single platform. You includes several diverse demo websites ripe for customization into dozens of different niche applications. From smooth AJAX-powered corporate or personal blog websites to second-hand furniture online shops, from niche gaming community social forums with HTML5-powered multimedia capabilities to serious professional websites for lawyers, engineers, doctors or dentists, businesses and corporations, You is the single tool you need to satisfy them all. With Visual Composer and Revolution Slider at your side, meeting graphical expectations and branding requirements is simple and speedy. Competent SEO optimization from the code base up renders You websites highly effective at ranking upwards within major search engines, resulting in traffic-friendly, lightning fast websites. Get You today, and let your clients see the real You! One Page Pro is a multipurpose WordPress theme emphasized in one-page layout designs. It can handle either boxed or full-width modes in one single space. It has multiple layouts for blogs, portfolios and galleries set ups. With the help of Drag & Drop builder and Revolution Slider your designs will amaze viewers. One Page Pro works mostly on a professional website orientation. It provides a powerful admin panel and and tons of pre-built features. Play with more than 19 headers and 6 footers. One Page Pro is mobile friendly, and compatible with all browsers. Adaptability and responsiveness is one of its keys. Social media sharing is available through buttons too. One Page Pro has a clean, minimalistic and modern concept and 3 topic demos. These go for corporate, CV and creative. Colors are unlimited and customizable, just like sidebars. One Page Pro uses the newest and well praised GoodLayers’ framework. It’s compatible WooCommerce and WPML too. It also has speed load and search enhancement through SEO. One Page Pro is well documented and fully supported. Modify anything at real time with its live customizer! Setting up a page has not been as easy before! Become an expert real quick with One Page Pro! Vigor is an incredibly fresh and amazingly youthful, delightfully bright and luminous, wonderfully well structured and very intuitively navigable, entirely modern and dynamic, clean and crisp, tech-savvy and resourceful, reliable and extensively developed, vast and impressive, stunning and responsive WordPress multiconcept, multipurpose website theme. Vigor is a uniquely new and modern WordPress theme, a conceptualized and sleek approach to website design and construction which incorporates the latest and greatest web development technologies alongside with impressively aesthetically polished and profoundly tasteful layout arrangements, smooth and gorgeous widgets and shortcodes and much more, brimming under the surface of a quiet, subtle, understated and deeply beautiful theme. Vigor is jam-packed with handsome visual effects and cutting edge technologies, making very effective deployment of hardware-powered Parallax technology combined with customized sliders, as well as seamless and smooth Video Background capabilities, gorgeous scrolling features and a myriad more ways to immerse users into an amazing and memorable experience. Vigor is quite flexible, packing trendy Blog Masonry and Grid layouts side by side with impressive Clients Carousels and business-friendly Testimonials and Team Members blurbs, as well as dozens of other useful and convenient shortcodes, easily customizable to perfectly suit your needs. Put some Vigor into your life, today! Themo is a unique and responsive WordPress creative parallax multipurpose website theme. Themo is an incredibly advanced platform for designing and developing modern websites. With Themo, you can easily articulate eloquent, expressive websites in a flash. Tech-savvy and intuitive, Themo includes an impressive, unique design interface. Choose, mix and match any of the 6 layer types. They include text, images, Visual Composer elements, custom modules and more. Then animate them as you desire with Themo’s exclusive Parallax composer. With the Parallax composer, you can craft your own animations and transitions as you wish. Rotate, colorize, fade in and out, all without writing a line of code! Themo is the only theme that allows detailed Parallax-based customized crafting today. Never hire a graphic designer again, just deploy Themo and build it yourself! Extensive documentation illustrates the workings of the Parallax composer. You’ll be churning out animations and transitions like a pro in no time at all. Advanced styling and coloring tools are readily available for you to play with. Customize your entire website in the most meaningful manner possible. Make a lasting impression on your every visitor and take your business to the next era. Check out Themo today, and make it big! Foundry is a deeply creative and spectacularly resourceful, highly imaginative and inherently flexible and pliable, seemingly unendingly ductile and technologically cutting edge and modern, handsomely structured and professionally composed, incredibly versatile and very mobile friendly responsive WordPress multiconcept, multipurpose website theme. Foundry is an astoundingly diverse WordPress theme, deliberately designed to service a range of different website archetypes and applications across all sorts of fields, interests and industries and for webmasters both seasoned and rookies alike, delivering an unfalteringly high quality website every single time, within minutes, and without having to touch a single line of code yourself. Foundry specializes in both flexibility and high performance, making it a smooth-running theme that behaves optimally under all usage cases and the most arduous stresses. With its lightweight and fast loading coding, Foundry can handle massive scale applications with ease and without skipping a beat, while its efficient and sleek CSS3 animations and styling combined with powerful, hardware-powered Parallax visual effects and features ranging from section-based Parallax image background to full-blown video backgrounds and delightfully smooth scrolling features. Foundry includes over 20 Home Pages for you to get things started on the right foot, and a slew of premium features like the Visual Composer and the beautiful Hero Slider, featuring Parallax capabilities as well. Cabin is a gorgeous and highly attractive, visually stunning and immersive, warm and welcoming, user and webmaster friendly, extensively documented and carefully crafted, professionally designed and developed, secure and reliable, trendy and modern yet decidedly aesthetically retro, creative and responsive WordPress vintage-inspired multipurpose website theme. Cabin is a smooth and purposefully beautiful WordPress theme, a creative and inspired solution for webmasters with a penchant for the vintage aesthetic or businesses seeking to appeal to a youthful and trendy audience that are looking for a powerful suite for developing, designing and maintaining sophisticated, modern websites across a broad spectrum of diverse fields and industries. Cabin requires absolutely no coding skills in order for you to speedily and effectively churn out the most professional quality, impressive websites with the most gracious and tasteful retro, vintage-inspired look and feel yet the most advanced and modern technological features combined into a seamless whole. Cabin includes a slew of well designed and thoughtfully structured page templates and demo websites, along with the premium Visual Composer page builder plugin expanded with dozens of custom, in-house developed shortcodes and elements for you to truly make your pages your own, along with the premium Revolution Slider and in-house developed Select Slider, featuring incredible Parallax slider options as well as smooth and enveloping Parallax background features ranging from images to videos that will give your website a distinctively modern touch. Movedo is a dynamic, sleek and responsive WordPress creative multipurpose website theme. Movedo is a toolbox for making modern websites without writing a line of code. With incredibly cutting-edge features, Movedo is the best way to get things moving. Based on an ultra-dynamic Parallax framework, Movedo keeps your content captivating. Movedo’s fine-tuned Visual Composer plugin powers brilliant new back-end necessities and possibilities. Every element within Movedo has customizable Parallax settings to fiddle with. This renders your pages constantly in motion, keeping your audience dazzled and engaged. From Parallax backgrounds to Parallax sliders and footers, Movedo’s movement is unmatched. Movedo also lets you make your own online shops within minutes. The WooCommerce plugin suite powers advanced features like checkouts and shopping carts. Over 50 convenient custom elements are at your disposition within a few clicks. They offer all sorts of awesome features you can deploy on any page. Parallax Video backgrounds are beautiful and expressive, while looking polished and seamless. The possibilities are endless with Movedo and its broad set of creative layouts. Parallax graphic effects are tastefully present throughout each of them. Hardware-powered Parallax technology makes your pages lightweight and fast-loading yet smooth and gorgeous. Take Movedo for a spin today! EPIC is a sleek and modern WordPress theme perfect for building any types of website. You can set this theme as one page or multi page, depending on your business needs. It comes with an extremely responsive layout that adjusts flawlessly on any types of devices with different screen sizes. Every graphic element of this theme is fully optimized for retina displays. Epic is feature-packed and offers users infinite customization possibilities. This theme comes with 8 pre-made skins in different color schemes for different purposes to help you build a stunning website without dealing with complicated codes. You can choose among the 4 different header layouts to match your branding requirements. Almost every area of this theme is modular so you can easily build it according to your needs and preferences. Using the theme’s advanced styling customization panel, you can edit the navigation styles, backgrounds for each section with colors, images or patterns. Additionally, this theme enables you to incorporate Ajax masonry portfolio in your website. EPIC allows you to add parallax effects to every page sections of your website. Its sticky navigation feature helps your visitors quickly find the content or product they are looking for in your website. This parallax ready business theme is designed using clean code and built with best SEO practices in mind to help your website get higher web traffic and rank well on search engine. Bridge is an elegant multi-purpose WordPress theme suited for business, agency, real estate, urban, fashion, café, app landing page, university (more education related themes), restaurant or any other creative use. Bridge is a highly customizable WordPress theme and it will handle everything you will throw at it. While this theme might look complex to set up, it isn’t thanks to dummy content and detailed documentation. This theme is ready to take your business and/or your website to the next level. Zerif is a sleek and bold multipurpose WordPress business theme developed with simplicity in mind. This theme is based on famous one page setup but you can use both one page and multi-page setup. Zerif is among the fastest loading premium WordPress themes on this collection thanks to its clean code base. The theme has several widget areas that allows you to extend its functionality from help of plugins and your own code. This is the right theme if you are looking for a clean business WordPress theme with nice CSS3 animations and parallax effect. Tower is a WordPress theme that can elevate your site to new heights of quality. If you choose to purchase this product, you will gain access to a series of incredible tools. Every feature promises to improve your page design, and enhance its technical aspects. Your view count is usually a measure of success on the online market. Every marketing campaign is basically a massive popularity contest, with companies striving to attract more page visitors. In order to increase your view count and bring more people to your site, you can always adopt a multilingual format. Translating your content is a great strategy, given that you will be able to cater to an international audience. Tower offers many personalization options, such as multiple Font Icon Packets. In addition, an excellent Megamenu was incorporated. When managing content-rich sites, you must take advantage of this theme’s multimedia slides. Every slide is able to display your best content, and shine a spotlight on your most successful articles. Basically, they allow you to put your best foot forward. A nifty One-Click Demo Importer allows users to design fully operational sites in a just a few minutes. Tower also facilitates the creation of incredible portfolios, given that it has incorporated more than 30 eye-catching portfolio layouts. RokoPhoto is a responsive WordPress theme created for photo blogs as well as other types or content-sharing blogs. This theme has a beautiful site header that you can use for displaying attractive photos the will certainly draw the attention of many visitors. This theme is crafted with a highly responsive layout that resizes on different kinds of devices such as computers and mobile devices. This theme comes with a very minimal design but completely packed with all the functionalities that a developer will need in constructing an awesome photography or portfolio site. It includes great typography settings that lets you adjust the font styles, sizes and designs you integrate in your theme. This theme offers unlimited color options to help you build an inimitable website for your content. It also features custom widgets that let you incorporate useful elements in your website. Moreover, you can use the theme’s social follow footer area for gaining more followers and growing your network. This simple yet easy-to-use website makes it easy for you to build a photography website without touching a single line of code. RokoPhoto is well-developed using clean and validated code that can be easily customized by any person with basic HTML/PHP knowledge. Blade is a visually refined and graphically polished, technologically cutting edge and very fast loading, powerfully developed and very user friendly, highly innovative and aesthetically graceful, fashionable and trendy, hip and clever, resourceful and well structured responsive WordPress multipurpose Parallax theme. Blade is a truly beautiful theme that has been gifted with the ample flexibility and raw power to easily muscle the demands of a whole slew of different and varied website applications and archetypes. That is due to Blade’s conceptually unique approach to page design, with immersive page layouts that rely strongly on the navigational experience side of the equation in order to provide an engaging and provocative website that users feel compelled to explore and digest. Blade has been decked out with handsome, hardware-powered Parallax effects and features that thoroughly immerse visitors in a profoundly appealing way that adds a layer of depth and substance to every page, making your websites feel more professional and polished in an instant. Blade includes the useful and convenient Visual Composer, along with plentiful multifunctional headers, one click full demo with dummy content importation, and the potent Redux Framework for maximum control with minimal hassle. Doesn’t get any sharper than Blade. Wow your viewers with Pond WordPress theme’s minimal yet very creative layout design. Pond is well-designed website template designed to help you create a professional creative portfolio using its easy to use demo importer. This theme is perfect for any projects you plan to work on as it offers tons of awesome features that you can use for setting up a website that will showcase your works or products on the web. With Pond WordPress theme, you can set your website as one page or multipage. Some of the cool features of this theme are the full width viewport border, impressive split sections and multiple header style options. Its single pagination in portfolio & blog items has a distinctive vertical orientation with a beautiful hover effect. This creative agency portfolio theme also allows you to modify the font settings via the theme options panel. And if you want your website to get the attention of your target audience, you can use its nice parallax & video backgrounds. This theme is also includes a powerful page builder that lets you add and manage your content. Moreover, it is bundled with Revolution Slider to help you create fascinating slides in your website. Pond includes Ajax Contact form that you can use for building list of potential clients or customers. This theme is fully responsive and retina ready to ensure that your visitors will have an amazing user experience. Bodega is a skillfully developed WordPress theme for any types of businesses aiming for a professional online presence. This theme comes with 30 carefully crafted theme demos to suit your business needs. Each demo is developed with a great attention to detail and a specific type of business in mind. Bodega offers you infinite design possibilities with the 6 header styles, various Google fonts, 4 icon sets and other nice theme options included in this theme. This theme is bundled with Visual Composer to help you set up a unique page layout using a drag and drop page builder. It also includes Layer Slider so you can opt to produce sliders with parallax functionality, image/video slides and unlimited custom animations. With the new SVG animations option included in the theme, you can now enhance the stroke paths of your own custom-made graphics in your sliders. This theme also comes with cutting-edge features such as line drawing animations, border drawing animations and animations controlled by scroll & clipping mask animations. Bodega offer users a “passepartout” option to help you add an attractive frame around your whole website. Since this theme is designed with business needs in mind, the developers of this theme integrated WooCommerce plugin in this theme to help startups and small business owners build a professional and organized online store for their business. Every single aspect of this theme is optimized for SEO to ensure that you will acquire get considerable amount of web traffic and rank well on search engines. Divi is a popular WordPress theme that has earned its status. It is modern, gorgeous, and very accessible to those who do not possess web development experience. Indeed, it would be hard to find another product that is so user-friendly and powerful. Right from the start, site owners will be able to load pre-made layout templates. This spares you from having to start from scratch, thus lightening your schedule. However, the option remains for those who prefer to craft unique, personalized layouts via the Divi builder tool. Divi is responsive towards all devices, even tablets and smartphones. In addition, the theme is cross-browser compatible, and your content can be showcased on high resolution Retina displays. As the technological landscape expands and takes over more aspects of our daily lives, cyber-security becomes a top priority. Thankfully, Divi has partnered with Sucuri.net, resulting in a secure and trustworthy WordPress theme. Its code was audited, and no issues were detected. Regardless of your website’s niche or purpose, its header must attract the reader’s gaze. Divi offers numerous header settings, including multiple menu areas, side navigation, centered logos, and so on. If you want to sample this theme and its features, be sure to access the live preview. It is currently among the most popular themes ever released for WordPress and is used by thousands of websites globally. WordPress theme you can read our full review. Establish website credibility for your brand using Zephyr WordPress theme. This theme is very innovative and provides interactive viewing in your website. Zephyr is an impressive business theme developed using the latest technique in website design. This theme has a very fluid and flexible design. Its fully responsive page layouts adjusts smoothly on all types of devices from large screen displays to mobile phones. This theme is also designed to look stunning and clean on retina displays. This theme includes Visual Composer, a drag and drop page builder that allow you to build unlimited number of unique layouts for your website. In addition, the Slider Revolution plugin is packaged in this theme to help you build splendid and super responsive slider for your website. Its intuitive and user-friendly admin theme options panel enables you to do alterations in your website design without touching a single line of code. This theme gives you unlimited customization options to change the look and feel of your website. Zephyr supports horizontal parallax backgrounds (depending on cursor movements) to will enhance the visual appeal of your website. This stylish website template is also WooCommerce ready to help you set up a virtual store with ease. Lastly, this theme is developed using proper HTML semantics and best SEO practices in mind. CleanLan is a fresh and sophisticated that lets you create a fully functional website in the twinkling of an eye. This modern theme is perfect for business-related websites like freelancer portfolios, digital agencies, marketing and promotions services, and eCommerce websites. This theme is packed with tons of useful features that enable you to customize the appearance of your business/company website without touching a single line of code. This theme comes with 10 awesome homepages, unique page layouts, 5 gorgeous header styles, fully integrated with Google fonts, 900+ icons, unlimited sidebars and other handy theme features that you can use for designing a distinctive website. CleanLab has a front-end page builder that helps you arrange the position of certain theme elements using the drag and drop functionality. The premium Revolution Slider is included in the theme to make creating slides really fast. This theme includes History Timeline to arrange posts or contents in chronological order. Moreover, this theme has masonry galleries, multiple blog post formats, unique blog layout options, and countless portfolio layouts. This theme supports Mega Menu to improve the sites navigation and help visitors explore your website with ease. If you are not yet ready to stream your website on the web or currently undergoing a major reconstruction, you can use its built in coming soon, maintenance mode and 404 error page. This theme has strong WooCommerce Support, which makes it possible for you to sell products and services to online customers. It also uses the newest HTML5 and CSS3 technologies to help your website standout from the crowd. Notio is a clean and high quality theme loaded with great customization features and options that allows you to construct an efficient website in an instant. This theme is compatible with WordPress 4.0+ and comes with a one-click installation and setup functionality to build your website in an instant. This theme has a super responsive layout that adjusts efficiently on different screen sizes. This theme boasts its retina ready and ultra-high resolution graphics for enhanced user experience. This theme gives you the ability to personalize every aspect of your theme and has strong focus on typography and usability. With the Visual Composer plugin bundled into this theme, you are now able to construct every page layout you can imagine. Notio is WooCommerce ready so you can sell your products or services online through your website. WooCommerce also includes built-in options for customers to add ratings and reviews about your product. Aside from its eCommerce support, this theme also comes with functionalities perfect for showcasing your professional portfolio. Other remarkable theme features included in Notio are: custom widgets, video background support, animated sliders and many more. Finally, it has an awesome social media integration that makes it easy for your customers to follow your social networking profile and share your content on different social media platform. Mobius is a clean and multipurpose suited for any kind of website such as business and corporate sites, e-shops, agencies, creative portfolio, blog and photograph sites. With Mobius WordPress theme, you are able to set up your theme using 1-click demo install. This theme is very easy to customize to suit your needs, thanks to its advanced admin panel powered by Redux Framework. This theme comes with a fluid layout design that adjusts smoothly on all kinds of devices. Mobius is bundled with a Visual Composer that makes building gorgeous page layout quick and easy just by dragging and dropping the theme element. This theme has exclusive slider specifically designed for Mobius WordPress theme and includes Slider Revolution plugin to help you build awesome slides and sliders for your website. It is comes with a Mobius Grid, which allows you to add a clean and organized masonry/grid layout for your works or content. Other features include: custom background header, creative portfolio, Live Ajax Search, mega menu support, Themeone shortcode generator and advanced color and typography options. Its powerful options panel allows you to change the look and feel of your website with no coding skills required. This theme is WooCommerce ready to help you sell digital as well as physical goods without much effort. It is developed using valid HTML5 and CSS3 coding to help you keep up with the latest web standards. Lastly, proper heading tags and coding standards are employed in this theme to guarantee good SEO performance. Osmosis is a fully functional website template inside and out. It features excellent customization options and brilliant aesthetics that allow you to create an impressive website with parallax effects. This theme is very easy to install and personalize. Its one-click dummy data allows you to import any of your chosen Osmosis demo to your website. It is ultra responsive and looks clear and sharp on retina displays such as smartphones and tablets. Osmosis has a built in options panel powered by Redux Framework that allows you to change the appearance and functionality of your website. It stylish camouflaged drop-down safe button help your users easily find the content they are searching for. It includes Visual Composer, a powerful drag and drop page builder that gives you absolute control of pages and posts in your website. The Revolution Slider is very handy in creating responsive and compelling slides for your website. It offers WooCommerce support to help you put up your own online shop with just few clicks and effortlessly sell your products. Osmosis is built using clean HTML5 and CSS3 code and compatible with the most popular SEO plugins in the market such as ‘All in One SEO Pack’ and ‘SEO by Yoast’. If you are looking for a multi-purpose WordPress business theme feature smooth parallax scrolling, look no further than Scalia. It is extremely versatile, packed with innovative features, and it is easy to use. Be sure to check out the theme’s informative documentation. You will be able to read about the options and features that Scalia has to offer. Stunning examples are included that you can use to setup your own website. It doesn’t matter if your site will be accessed from mobile or desktop devices, as it is fully responsive. Users will not encounter any compatibility issues on any device. The support system is top-notch, as the well-trained staff members are eagerly awaiting your question. No issue is too big or small, so do not hesitate to contact the friendly representatives. The Scalia theme include over 150 fully functional demo pages, along with some sliders and templates. There is a limitless number of page customization options, as users can personalize every single element of their site. All of this can be achieved via the powerful Administration Panel, and it does not require any coding knowledge. Be it sprawling multipage designs, or simple one page layouts, Scalia has your back. This theme has a large number of colors and fonts, a flexible header and footer, and over 400 distinct font icons. Scalia theme is the right choice if you are looking for parallax WordPress theme that can handle everything starting from a simple landing page all way up to complex business website or even eCommerce website. If you are not convinced that this is the right theme for you, make sure to read our detailed Scalia theme review. Morpheus is an ultimate WordPress one page parallax theme that you must see to truly understand the power of parallax. Developers have made sure that they haven’t overdid these special effects and it has this perfect mix of usability and style. This theme can be used as one page or multi-page but to get the best out of the theme you might one to choose to go with one page option. Morpheus is great for any business, portfolio, event, app, software website. Story is an ultimate WordPress theme ready to tell your story with style. This theme has full screen background image and video option which can be combined with slider, portfolio, gallery or even e-commerce setup. Story theme can become the next big thing your business, application, software, agency or any other organization. Altus is a clean and modern flat design WordPress theme designed to be used for business, corporate, portfolio, e-commerce, blogs and any other creative and clean website. This theme comes with WooCommerce integration, various premium slider options and drag & drop visual page builder to create professional and beautiful without writing a single line of code. Salient is my favorite theme for now and I have used it for several of my client projects. It is highly customizable theme with dozens of options for front-page, portfolio, blog, services, estore and other pages. It is optimized to work with WooCommerce to sell your own merchandise. This theme can be used for corporate, business, eCommerce, blogs, portfolio, or any other website. It has an overwhelming amount of options and it might take some time to get through them. Salient theme has detailed documentation that will get you started. Developers are very helpful and offers free support. Salient theme is regularly maintained and recently faced major overhaul which was exclusively focused to polish rough edges. Lobo is a minimalistic WordPress portfolio theme for freelancers, creative agencies, photographers and anyone looking to showcase their work online. It is a very clean and bold theme with modern navigation options but yet they are very intuitive and easy to understand for everyone. Lobo is a great theme for portfolio but it has a beautiful blog layout that you will appreciate and be willing to use for your website. BeTheme is everything you will ever need if you are web designer and developer. This theme has 20 different layout options for portfolio, business, app landing page, WooCommerce. You can create 20 different website without reusing the same elements and this is truly outstanding theme at this price level. BeTheme is the best suited for very demanding users and those looking to create multiple website for different products, clients or apps. Willow is a modern one page template suited for business, agency, freelancer, apps or other creative use. This theme integrates parallax scrolling effects that are very well done and works well on all devices. Willow is designed using Bootstrap 3 framework which uses mobile-first approach to keep up with the latest web trends. The Financial Advisor Responsive WordPress Theme is an ideal product for those who value quality and consistency. In an age where there is a broad spectrum of devices, this is a theme that can run on any platform. This opens up your possibilities, and allows you to target mobile users who own tablets and smart phones. For those who prefer a more hands-on approach, a live demo was made available. This theme has incorporated many modern features, such as cutting edge graphics and innovative short codes. Each template is constructed with care, and it is very easy to customize. Personalization is the key to proper online marketing. Each client can choose how his site will look, thanks to this theme’s staggering amount of options. There are several variations for your post types and formats, giving you plenty of opportunity to tailor your site and make it truly unique. As word spread and your pages become more popular, they will attract a more diverse roster of potential customers. Thankfully, this product is prepared to accommodate them, due to the WPML certification. This can turn your site into a true multilingual online portal, with content available in many languages. There were over 80 short codes added for your convenience, as well as some interesting color options. Custom typography choices are plentiful, due to the inclusion of over 600 beautiful Google Fonts. In addition, eye-catching galleries can showcase your amazing images, proving to your followers that artistic taste is one of your many qualities.Upon purchasing this theme, you are guaranteed a lifetime of free update. This will assure that your site will always keep up with the latest technological and social trends. Search engine optimization is another key feature that was integrated, as your marketing campaign depends on search result listing. SoapTheme’s website theme products are a combination of design, user-friendliness and affordability. We not only make a website attractive but also interactive, without requiring a site owner to spend thousands of money. A beautiful template apart from a great content draws more visitors, which then results in more search engine traffic to your site. We are a team of professional developers that build Sophisticated, Optimal, Appealing and Peerless website themes. Our pursuit of providing a clean and beautiful appearance for every website, as soap promises a glowing skin, explains the etymology of SoapTheme. Please check our wordpress and magento themes!